This three-axis accelerometer is a breakout board for Freescale’s MMA7361LC (177k pdf) and MMA7341LC (177k pdf) MEMS (micro-electro-mechanical systems) low-g accelerometers; we therefore recommend careful reading the appropriate datasheet for your particular carrier board before using this product. The MMA7361 and MMA7341 are great ICs, but their small, leadless packages makes them difficult for the typical student or hobbyist to use. This carrier board includes all of the components in the part’s recommended connection diagram and includes a 3.3V 50mA ultra-low-dropout linear voltage regulator, which allows the accelerometer breakout board to accept a wide range of input voltages (2.2-16 V) with power to spare for additional 3.3V components. The accelerometer’s pins are 0.1â€³ spaced to work well with standard solderless breadboards and 0.1â€³ perfboards. The two versions of this board provide different sensitivity options. 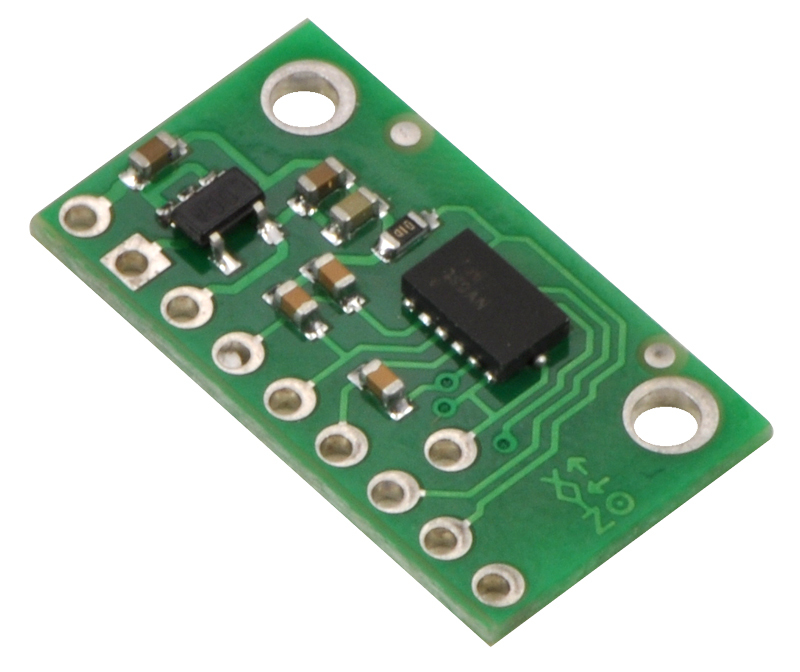 Boards marked with a black X, the MMA7361LC 3-axis accelerometer carrier, offers selectable Â±1.5g or Â±6g sensitivities, and boards marked with a red X, the MMA7341LC 3-axis accelerometer carrier, offers selectable Â±3g or Â±9g sensitivities. We also sell two smaller versions of this carrier board without the voltage regulator: the MMA7361LC 3-axis accelerometer carrier, and the MMA7341LC 3-axis accelerometer carrier. The sensitivity selection pin, g-Select, is internally pulled low, which selects for a default sensitivity of Â±1.5g (800 mV/g) on the MMA7361LC carrier and Â±3g (440 mV/g) on the MMA7341LC carrier. Driving the pin high selects for a sensitivity of Â±6g (206 mV/g) on the MMA7361LC carrier and Â±9g (118 mV/g) on the MMA7341LC carrier. The 0g-Detect pin outputs high when all three axes simultaneously detect 0g, which happens when the board is in free-fall. This pin is only documented in the datasheet of the more sensitive MMA7361LC IC (the MMA7341LC datasheet labels this pin as “NC”), but we have found that it works on the MMA7341LC at its default Â±3g sensitivity. This output does not work at the Â±9g sensitivity setting. A 10×1 strip of 0.1â€³ header pins, a 9×1 strip of 0.1â€³ right-angle header pins and one shorting block are included, as shown in the picture to the right. Note: Prior to 2012, these boards shipped with older, pin-compatible MMA7361L (175k pdf) and MMA7341L (175k pdf) ICs. The only functional differences between the MMA73x1L and their MMA73x1LC counterparts are a slight change to the tolerance of the zero-g Z output (both MMA7361LC and MMA7341LC) and change in the magnitude of the z-axis self-test response (MMA7341LC only). Revision 2 of the MMA7341LC datasheet also decreased the high-g selectable sensitivity range from Â±11g to Â±9g, though the corresponding specification of 118 mV/g did not change.